Secretary General Guterres strongly condemned the rise of Antisemitism in the world, and stated the importance of standing up against it: “We reaffirm our resolve to fight the hatred that still plagues our world today. It is necessary more and more that we sound the alarm. 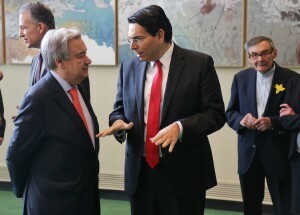 Inevitably, where there is Antisemitism, no one else is safe,” Said Guterres. “The Jewish people and the Jewish state will remain alive, strong and determined forever. We are embracing an era that will never see us go,” Danon said.